1939 One way or the other there was often relief at hand. All one had to do to escape the levanter was to move to the other side of the Rock. Luckily this was where most of the more popular beaches of the Rock were found. Elsewhere Hitler continued to make warlike noises and Europe held its breath. Although Harry was a kind and generous man, he also happened to be an unmitigated snob. He was, among other things, a Justice of the Peace, agent for an important shipping line, President of the Med. Rowing Club, and Consul for, of all places, Liberia. On the strength of all this he was often invited to official functions by several of Gibraltar's Governors. 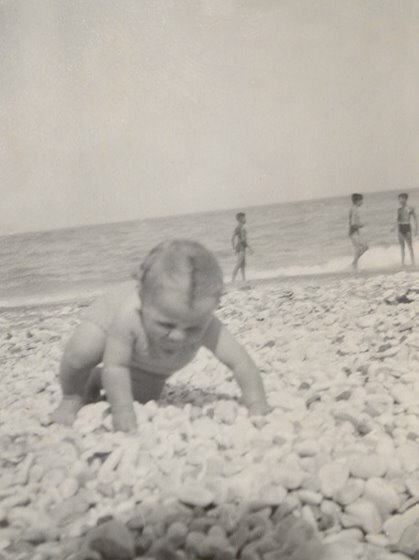 It was a stock joke of the Eastern Beach crowd to enquire politely whether he was required to wear national costume, by which they inferred tophat, tie and loin cloth, whenever he was invited to the Convent. Harry took all the flak in his stride. A compulsive name dropper, he was constantly reminding himself and others of Godley, Harrington and Liddell. His local nickname was Harry 'Bomba'. Eastern Beach. 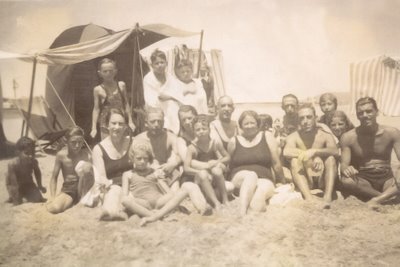 This photograph includes many family friends and acquaintances who went to Eastern Beach with them during the pre-war years. My father sits in the front row second from the right and the man beside him with the imposing physique is his good friend Jim Garbarino. 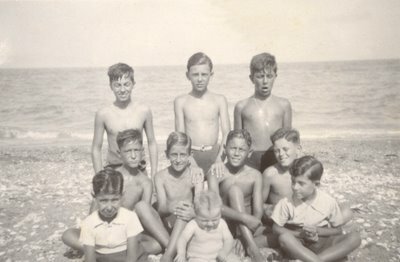 Maruja sits just behind both of them and Eric stands in the middle with his good friend Paul Garbarino to his right. In the middle and just behind the rather plump lady sits Harry Cardona known locally as Harry ‘Bomba’. He was an unmitigated snob and name dropper. Harry’s son Leslie, who was not too keen on getting wet and to whom his father would often remonstrate by shouting from the water to ‘look at daddy swimming’, is sitting second from left. Even dry, he still doesn’t look too happy. This must have been the first of my many enjoyable summers in Sandy Bay. My fancy hairstyle was known locally as a ‘kikiriki’. My mother seems to approve. The volunteers soon discovered, however, that those same four guns were the Rock's sole air defences. For quite a while the guns were constantly and ostentatiously moved about from gun site to gun site leaving behind dummies made of crates and thick pipes. 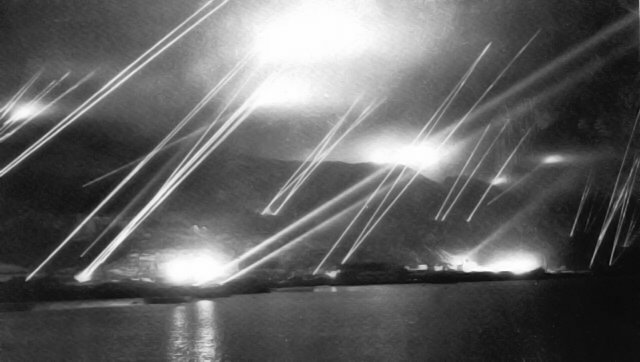 The intention was to give spies the impression that the Rock was teeming with anti-aircraft guns. Perhaps in an effort to avoid all this movement of military ordnance, Lina would often take Neville in his pram through Lover's Walk, a relatively unfrequented side road. There she made friends with another lady on a similar mission. She was Katie Serruya, a German Jewess from Leipzig who had managed to get out of Germany just in time by marrying a Gibraltarian, a man from a wealthy family with a shop in Main Street. By coincidence, Katie was eventually to become one of Baba's bridge friends. She was a beautiful woman, slim and delicate in a way reminiscent of Marlene Dietrich. Yet another Lover's Walk mother was Mrs. Hathaway. Her baby son Lewis would grow up to be my closest childhood friend. Whatever civil liberties had been gained over the last few years would soon be abandoned by the necessities of war. The first thing to go was the municipal council. Their meetings were suspended indefinitely. Among the general population, however, the prevailing mood was one of misplaced confidence. In Gibraltar, the movement of warships and troops hardly caused a stir. People were used to such things. The combined British Fleet in Gibraltar harbour on the eve of the Second World War. An impressive sight but by no means unique. Even after the war whenever the US Sixth Fleet coincided in port with the British Mediterranean Fleet the harbour was just as overcrowded. On the first of September Germany and Russia invaded Poland. Two days later Britain declared war on Germany and the 'Phony War' began. Maruja was thrilled both by the hullabaloo when the announcement came through and by the fact that the girls were sent home from school for the rest of the day. As the world prepared for war Gibraltar quickly ceased to be a subject colony. It returned to its roots as a military fortress. A strong defensive system was built facing Spain. Galleries were blasted out of the rock for a series of guns that would command the isthmus and the old Devil's Tower was destroyed to improve fields of fire. Blackouts, curfews and wailing sirens became the order of the day and armed patrols skulked around in the dark. The air raid shelters had already been built and exercises in air raid precaution and gas mask drills became frequent events. Trying out the Rock’s anti-aircraft defences. It must have been quite a show. As for the Civil Defence antics, they still seemed something of a game. 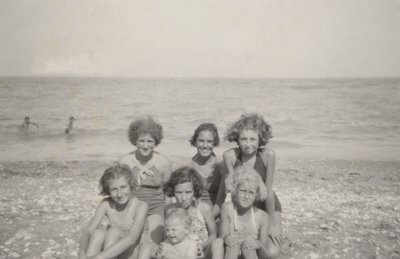 Close perusal of family photos show not the faintest shadow of gathering war-clouds on anyone's face. Eric, for one, was enjoying every minute. At school the air raid drills were providing wonderful opportunities for disrupting academic activities. At the appointed hour a bell would ring ominously and the whole school would stampede across the road to the shelter at Line Wall. Once inside time would pass quickly enough as the pupils took to singing popular songs at the top of their voices. All great fun for the kids but it must have been a real headache for the Christian Brothers. In fact the smell of the gas-masks was about the only thing that gave Eric any sense of foreboding. He had the gloomy conviction that the damn things wouldn't work when the crunch came. Luckily they were never put to the test. It is impossible to say whether this was simply official propaganda or whether the Director actually believed what he had written. What is more than likely is that those who read it were probably inclined to agree. Composers of popular songs also took an optimistic view and began to write songs that treated the war as some sort of a joke. There were many other songs, all with equally appalling lyrics, but perhaps the following bears special mention as it probably made the equivalent of the top twenty pop tunes at the time. 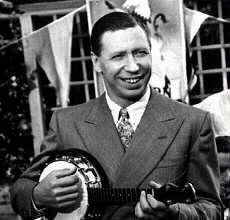 George Formby. A very popular war time singer. Little did anybody realise how many lives would have to be sacrificed before mother dear's washing could get anywhere near the Siegfried Line. At the time a contingent of the Welsh Guards were temporarily stationed in Gibraltar. They were the real McCoy. Six-footers to a man and wearing distinctive caps, they were considered an elite corps and as such attracted the hostility of men from other battalions. They were billeted in South Barracks and on their way back from town in the late evenings the men from one of the local units, the King's Regiment, made it a habit to ambush them and soundly beat them up. Meanwhile the Rock ape population had declined to eleven. Perhaps the animals had realised that an era was coming to an end and that another very different one was about to begin. More Eastern Beach photos. In the top photo my sister Maruja is back left and I am the baby in the front. The girl to the left of my sister is Anita Alcantara. In the bottom one, Eric is on the right in the middle row, and that is me again in the front. Paul Garbarino is sitting beside Eric and Anita’s brother John Alcantara is on the right of the middle row.